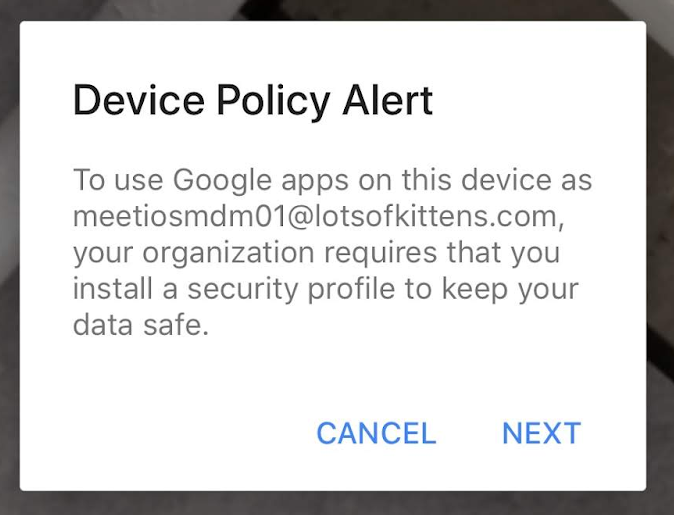 *Users in domains with basic mobile device management enabled won’t be required to install the device policy profile; their iOS devices will automatically become managed when they sign in to Hangouts Meet. This only impacts iOS users who don’t already have the device policy profile installed. 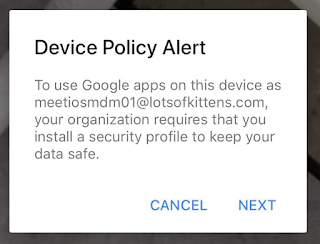 If your organization currently has advanced MDM enabled, your users would have been required to download the device policy profile in order to access Gmail, Calendar, and other Google apps on their iOS devices. Starting on June 19th, iOS users who try to access Hangouts Meet will see a notification prompting them to install a security profile. This notification will only appear for users on Hangouts Meet v16.0 and above; users can upgrade to this version starting on June 4th. Users on older versions of Hangouts Meet will be able to sign in to the app, but they’ll be unable to perform critical functions (e.g. to view and join meetings). They should upgrade to v16.0 so that they receive the prompt and can install the required device policy profile.